Italy served as the cradle of modern civilization, and has lessons yet to teach the world. 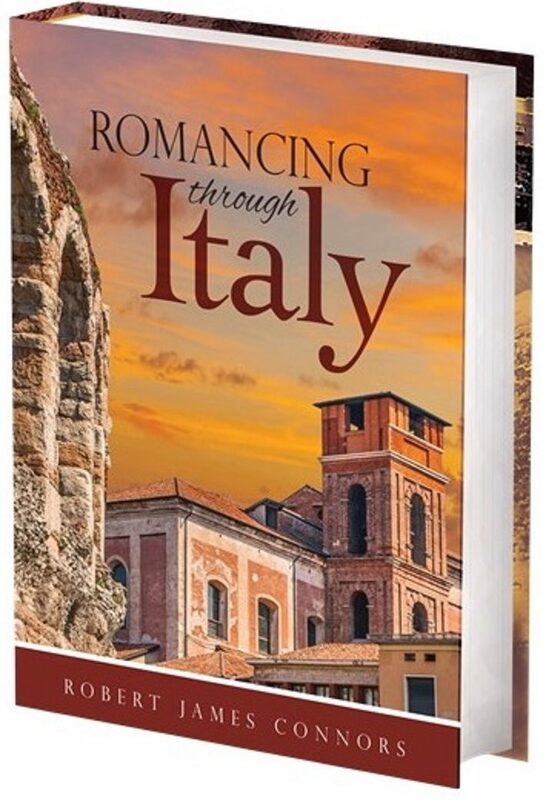 Romancing Through Italy is a journey through the culture, history, cities, and landscapes of the long peninsula. Famous cities and obscure hilltowns, Wealthy dukes and impoverished farmers come to life in this glowing tribute to the Italian people. “…George then surprised us by appearing in a complete WWII U.S. Army uniform, only his familiar lined face and white hair giving him away. He seemed transformed His dress shoes gleamed, and even his belt was polished. At age 80, George was suddenly, once again, an American soldier. On his shoulder he wore wore a blue quadrifoglio patch. We asked, and learned that it was the symbol his 88th Division, known as the ‘Blue Devils.’ Because of the shape of the patches they were also sometimes referred to as the Clover Leaf Division. Those were names that would echo through our experiences. Our first visit to Italy was about to come to an emotional crescendo. George had barely arrived before he was surrounded by a small cluster of men, some of whom hugged and kissed him enthusiastically on both cheeks in the Italian manner. Most wore the distinctive peaked cap of the Alpini troops, marked by their plumes, and many had dressed in remnants of their old uniforms as well. This was to be a reunion of heroes, a gathering of those who had survived the terrible conditions and bloody fighting. The crowd began to swell and the band struck up a lively tune. Entire families turned out. We had been to observances in the United States that drew little attention beyond a few veterans, family members, and an honor guard. In Italy, it seemed, they paid much closer attention to their history. We only later began to fully understand the terrible sacrifices that had been endured, and how indelibly those events were burned into the communal memory. With so many well-wishers surrounding him and speaking excitedly in Italian, we had no further opportunity to get close until after George had delivered a speech, led the parade, and been honored at the banquet that followed. When we did, we were full of questions. We asked him about what had happened in Monghidoro during the war. It seemed like a peaceful and insignificant small town, not the sort of place that world powers would spend much time fighting over. This, George explained, was where the Germans had made their second winter defensive line, and was the scene of bloody fighting. His story was gripping. We learned just how difficult life under Nazi-Fascists had been. Fanatic Nazi SS troops had slaughtered entire villages in nearby Tuscany, simply rounding up the population in house-by-house sweeps before machine-gunning them. Bodies were left where they fell. It was only later that people arrived from neighboring villages to find and bury them. The day before the arrival of the Americans, as the Nazis prepared to fall back to yet another line of prepared fortifications farther north, they performed their darkest deeds around Monghidoro. Arriving in the night, soldiers led by Fascist collaborators had rounded up groups of men for brutal interrogations. Families were terrorized, and many were forced from their burning homes into the freezing night without food, water, or clothing. On that first day of October, dozens of people were simply executed, led to their deaths by platoons of soldiers. Small monuments scattered across the district mark where they fell. “I was the only one in my division who could speak Italian, so I did a lot of translating, even though I wasn’t an official translator. People would approach the troops with an issue, or we would need to tell them something, and I would get the call. I guess I helped a few people out that way,” he told us in his understated manner. Glancing around the alpine setting and the deep valley below, it was easy to imagine the town in the dead of winter, with slick, icy roads and footpaths through the rough terrain. George continued his story, quietly relating the long-ago events. Enter your email address to register for free eBook, follow this blog and receive notifications of new posts by email. Westminster Books, 445 King St., Fredericton, N.B. Portland, Maine Sunday, June 24 1:00 pm. Exploring the "Park of Monsters"